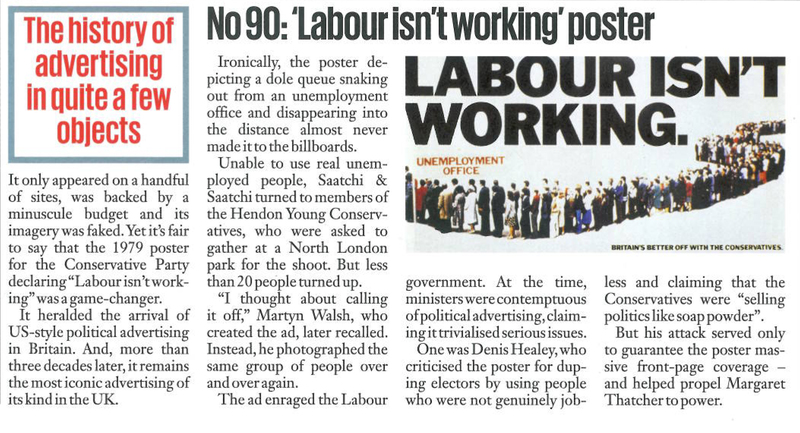 Advertising industry trade magazine Campaign has today run a feature on the history of the most famous piece of political advertising in British history – Saatchi & Saatchi’s Labour Isn’t Working (1978) for the Conservative Party. 1. The poster was picked out from a selection of roughs by Gordon Reece, Thatcher’s election strategist. 2. The people in the queue are not genuine unemployed people, but are in fact members of Hendon Young Conservatives. 3. Martin Walsh photographed the same people over and over again, rather than a single long line, due to the shortage of volunteers for the shoot.